The reddish star Aldebaran – the fiery eye of the Bull in the constellation Taurus – is an aging star and a huge star! The computed diameter is between 35 and 40 solar diameters. 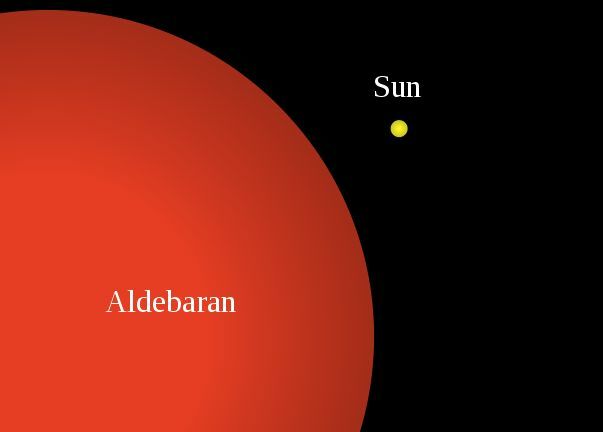 If Aldebaran were placed where the sun is now, its surface would extend almost to the orbit of Mercury. Follow the links below to learn more about this prominent and fascinating star. History and mythology of Aldebaran. Science of star Aldebaran. This star glows with the orangish color of a K5 giant star. In visible light, it is about 153 times brighter than the sun, although its surface temperature is lower (roughly 4000 kelvins compared to 5800 kelvins for the sun). Aldebaran is about 65 light-years away, much closer than the stars of the Hyades with which it misleadingly seems associated. The Hyades are about 150 light-years away. Aldebaran is an erratic variable with minor variations too small to be noticed by the eye. It also has a small, faint companion star, an M-type red dwarf, some 3.5 light-days away. In other words, light from Aldebaran would need to travel for 3.5 days to reach the companion, in contrast to light from our sun, which requires 8 minutes to travel to Earth. How to see Aldebaran. Aldebaran is easy to find. Frequently imagined as the fiery eye of Taurus the Bull, Aldebaran is part of a V-shaped star grouping that forms the face of the Bull. This pattern is called the Hyades. 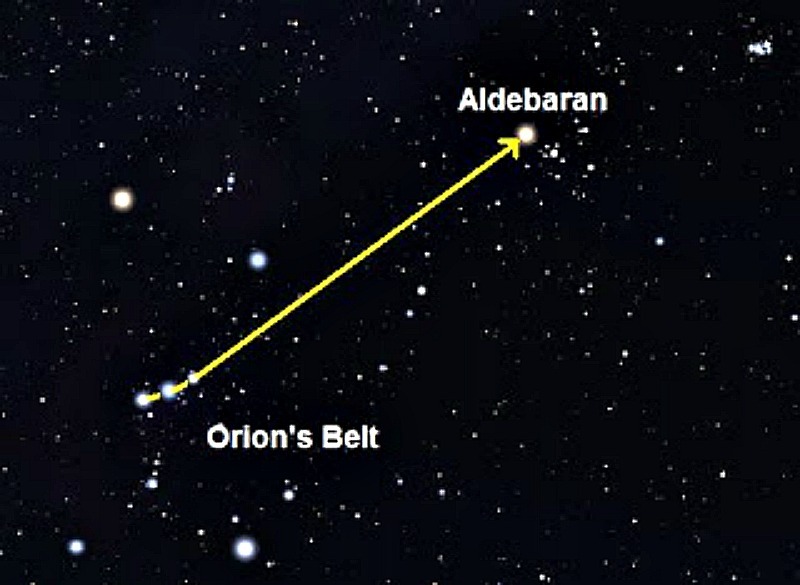 You can also locate Aldebaran using the famous constellation Orion as a guide. Simply locate the three stars of Orion’s Belt. Then draw an imaginary line through the belt to the right. The first bright star you come to will be Aldebaran with its distinctive reddish-orange glow. Aldebaran is the 14th brightest star, but five of those that outshine it are only barely visible or not visible at all from much of the Northern Hemisphere. Aldebaran is primarily a winter and spring star. At least, that is when this red star is most easily visible in the evening sky. By early December, it rises shortly after sunset and is visible all night. Three months later it is high to the south at sunset, and sets at around midnight. By early May, it hangs low about the western sunset glow – and before the end of the month, it’s lost altogether. It returns to the predawn sky around late June. By the way, although it appears among them, Aldebaran is not actually a member of the V-shaped Hyades cluster. It is actually much closer to us in space than the actual Hyades stars. 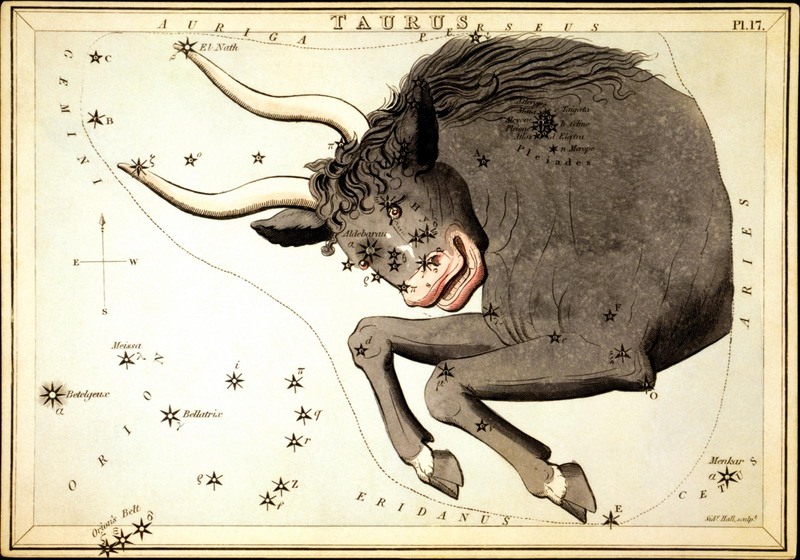 Constellation Taurus. See Aldebaran marked as the Bull’s Eye? View larger. History and mythology of Aldebaran. Aldebaran is often depicted as the fiery eye of Taurus the Bull. Because it is bright and prominent, Aldebaran was honored as one of the Four Royal Stars in ancient Persia, the other three Royal Stars being Regulus, Antares and Fomalhaut. The name Aldebaran is from the Arabic for “The Follower,” presumably as a hunter following prey, which here likely was the star cluster we call the Pleiades. The latter was often viewed as a flock of birds, perhaps doves. According to Richard Hinckley Allen in his classic book Star Names, the name Aldebaran once was applied to the entire Hyades star cluster, a large loose collection of faint stars. In Hindu myth, Aldebaran was sometimes identified with a beautiful young woman named Rohini, disguised as an antelope and pursued by her lecherous father, disguised as a deer, Mriga. Apparently several ancient peoples associated the star with rain. The Wikipedia entry notes a Dakota Sioux story in which Aldebaran was a star which had fallen to the Earth and whose killing of a serpent led to the formation of the Mississippi River. Allen notes a number of other alternate names, but precious little mythology is known for Aldebaran separately. Aldebaran is the name of one of the chariot horses in the movie Ben Hur. On a different note, astronomer Jack Eddy has suggested a connection with the Big Horn Medicine Wheel, an ancient circle of stones atop a mountain in Wyoming. Eddy wrote that the ancient Americans may have used this site as a sort of observatory to view the rising of Aldebaran just before the sun in June to predict the June solstice. Interestingly, in about two million years, the American spaceprobe Pioneer 10, now heading out into deep space, will pass Aldebaran. Bottom line: The star is so Aldebaran huge that, were it in our sun’s place, its surface would extend almost to the orbit of Mercury.